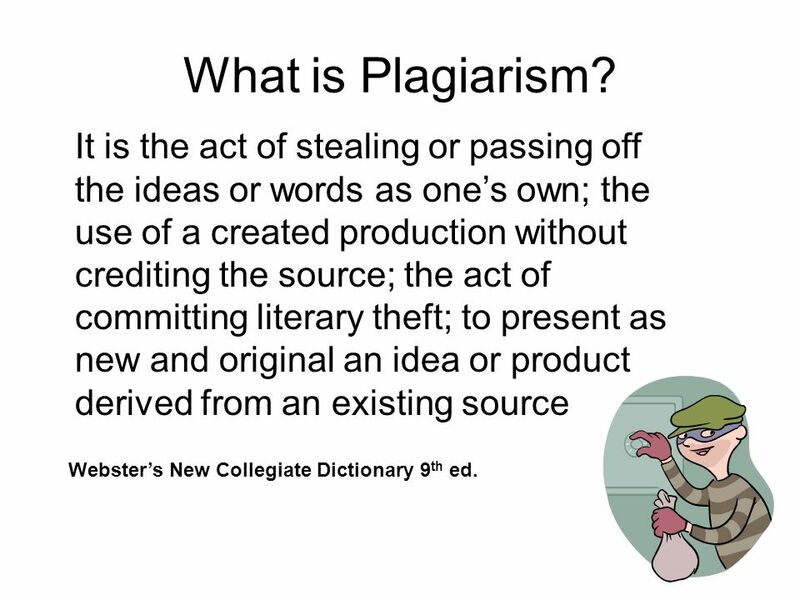 2 What is Plagiarism? It is the act of stealing or passing off the ideas or words as one’s own; the use of a created production without crediting the source; the act of committing literary theft; to present as new and original an idea or product derived from an existing source Webster’s New Collegiate Dictionary 9th ed. 3 What is Copyright? 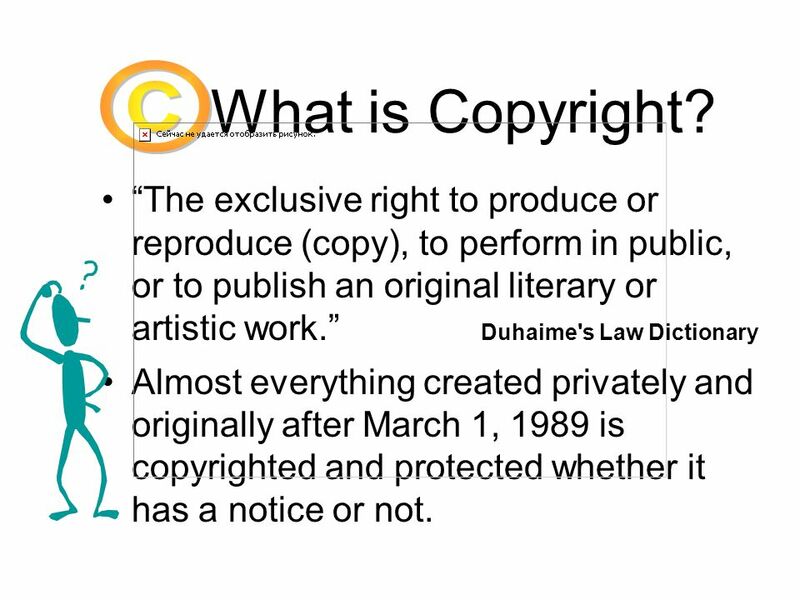 “The exclusive right to produce or reproduce (copy), to perform in public, or to publish an original literary or artistic work.” Duhaime's Law Dictionary Almost everything created privately and originally after March 1, 1989 is copyrighted and protected whether it has a notice or not. 4 If you didn't produce it, it isn't yours! In other words…. 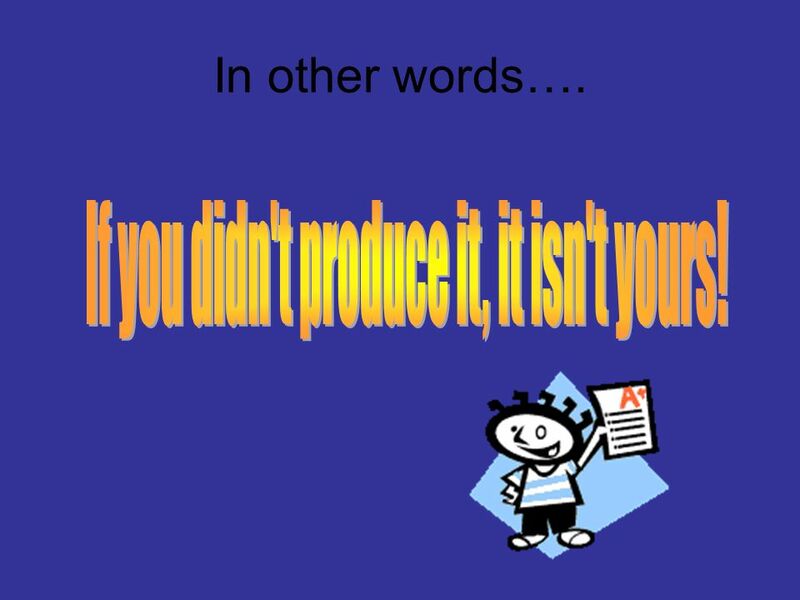 If you didn't produce it, it isn't yours! 5 So how can I use it? You may rephrase anything that your read. In other words, put it into your own words. Do NOT copy anything word for word. Unless… You are quoting someone. You may use direct quotes if you put it in quotation marks, and site your source in the content. 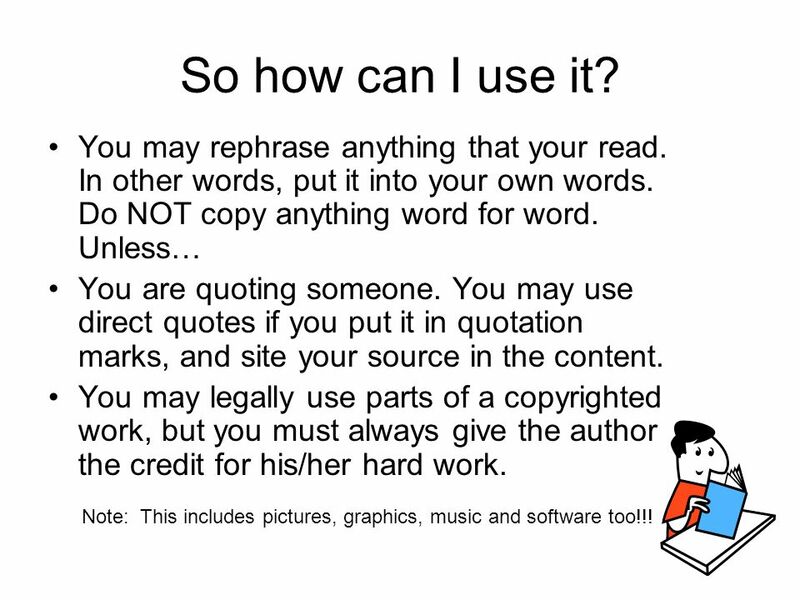 You may legally use parts of a copyrighted work, but you must always give the author the credit for his/her hard work. Note: This includes pictures, graphics, music and software too!!! 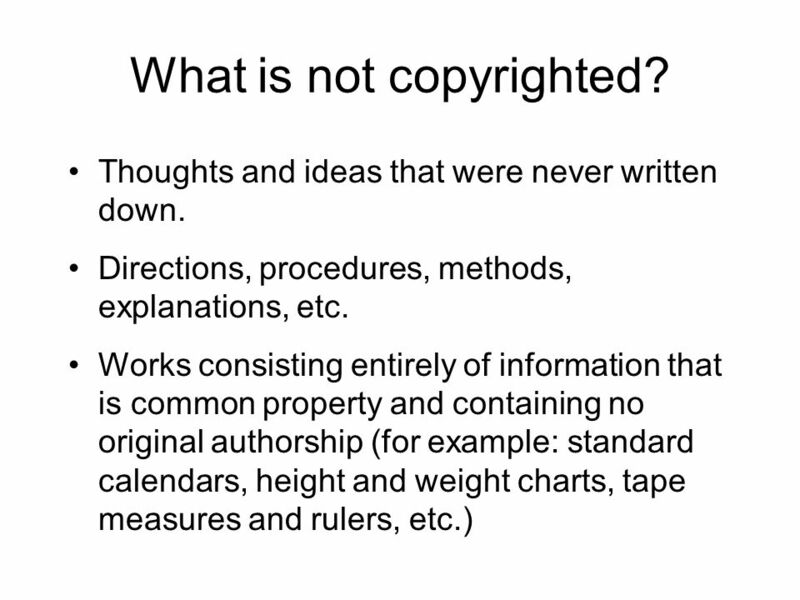 7 What is not copyrighted? 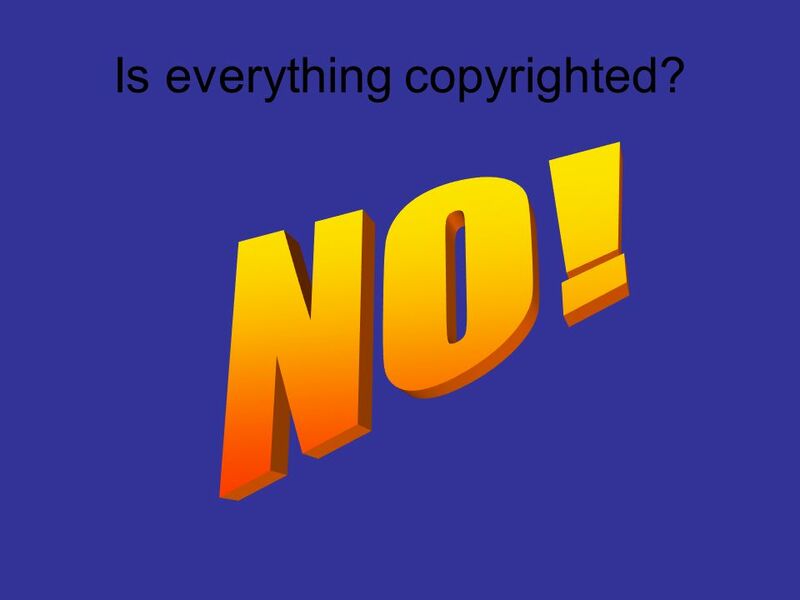 8 What is not copyrighted? 9 Remember! Does your using the material hurt the market? In other words, is it causing someone to not purchase the item themselves? 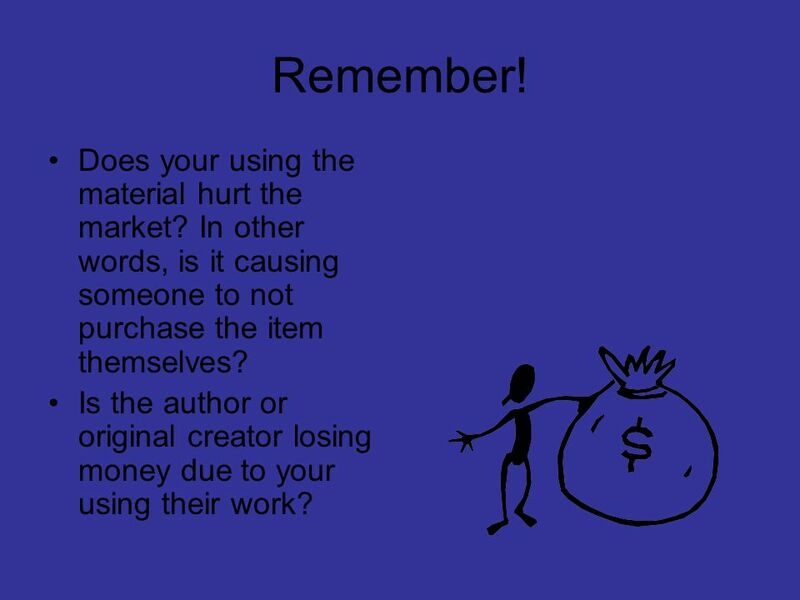 Is the author or original creator losing money due to your using their work? 10 So what does that really mean? It's all about the cash! 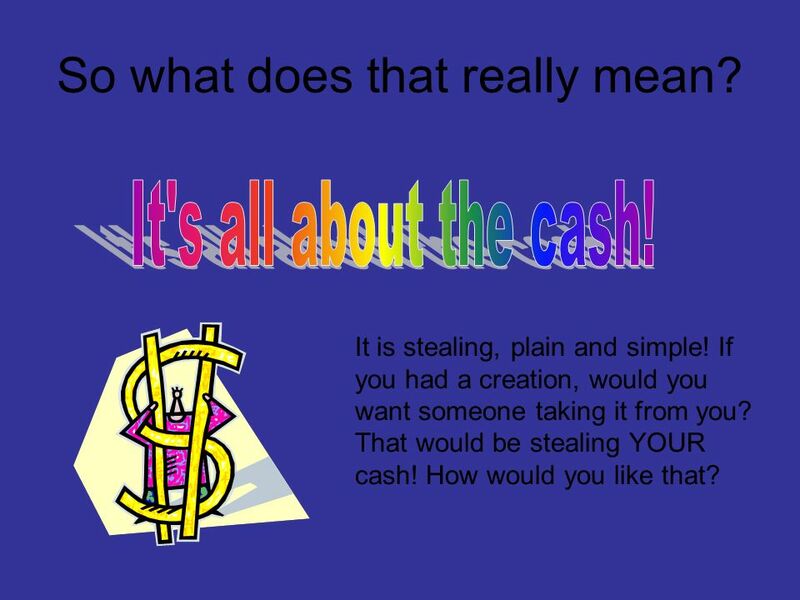 It is stealing, plain and simple! If you had a creation, would you want someone taking it from you? That would be stealing YOUR cash! How would you like that? 11 To Put It Simple… DON'T! If you didn’t produce it, you don’t own it. 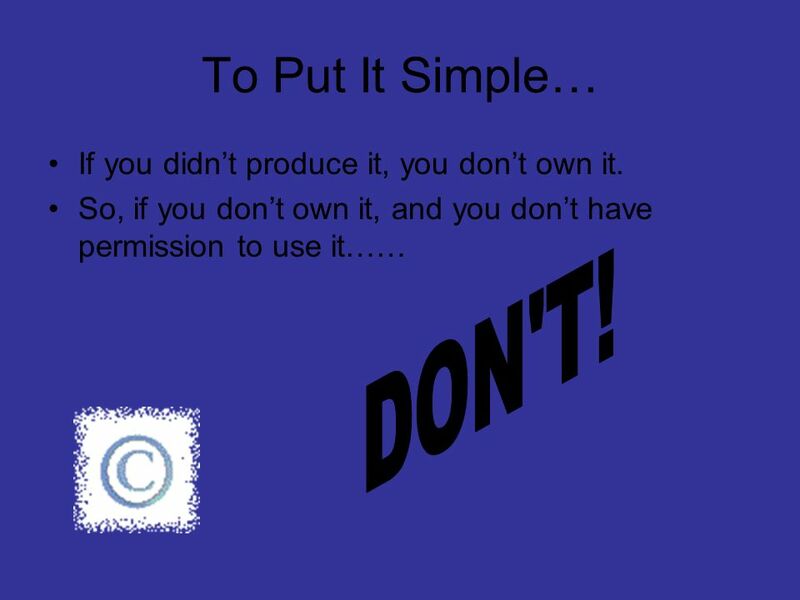 So, if you don’t own it, and you don’t have permission to use it…… DON'T! 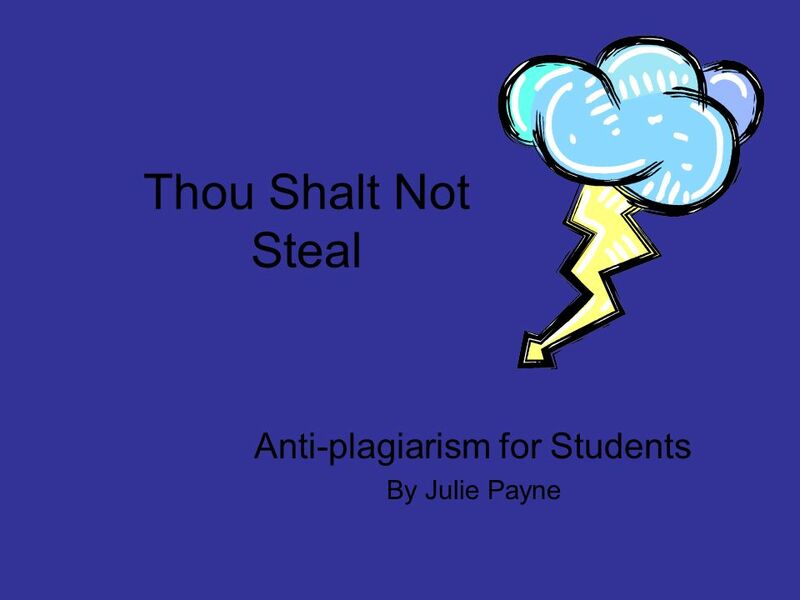 Download ppt "Anti-plagiarism for Students By Julie Payne"
To plagiarize or not plagiarize? That is the question. Copyright Your rights and responsibilities in the U.S.
© Intel. All rights reserved. Slide # 1 Presentation created for the Intel ® Teach to the Future program by Judi Edman Yost Institute of Computer. Dos and Donts of Table of Contents Next Page Previous Page Glossary Return to last page viewed Exit. Copyright Basics A Brief Introduction to Copyright and Fair Use for MTU Graduate Students Nora Allred J. R. Van Pelt/Opie Library. Thou Shalt Not Steal! 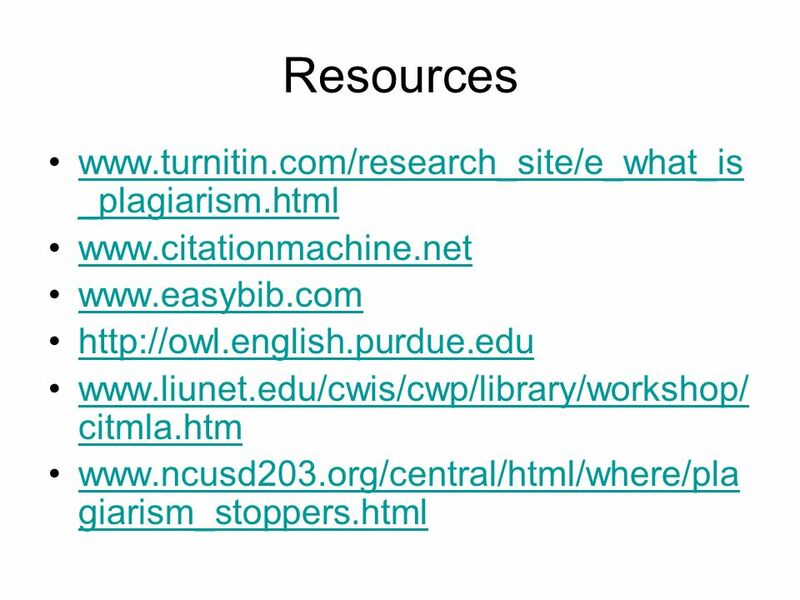 Learning About Plagiarism What is plagiarism? 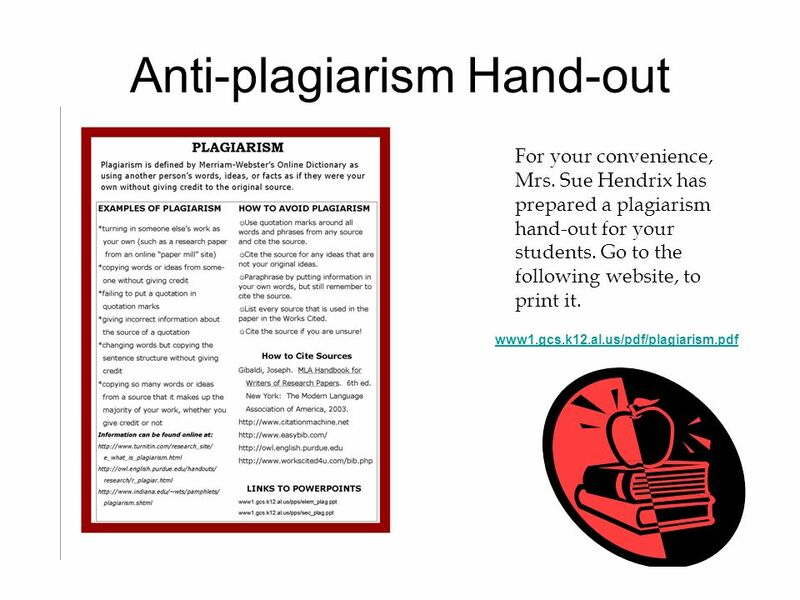 Plagiarism is handing in someone else’s work to your teacher and putting your name. 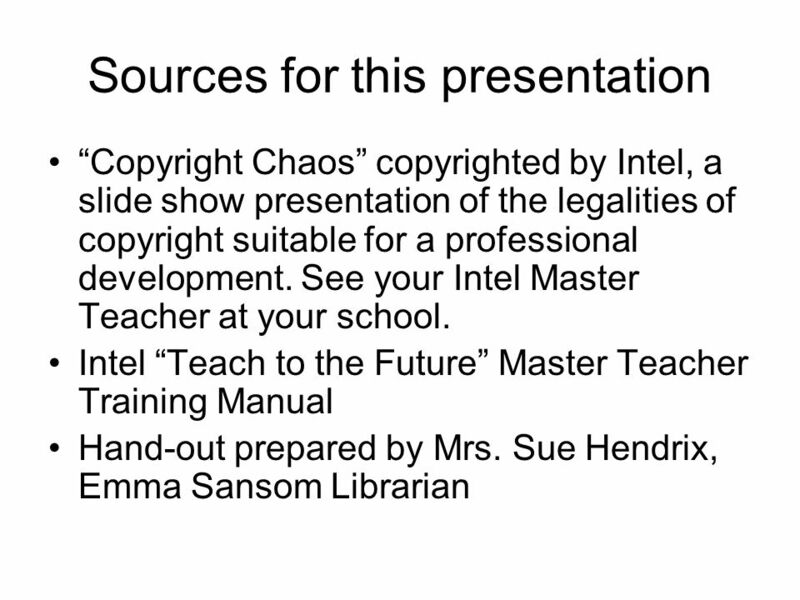 Slide # 1 Copyright © 2008 Intel Corporation. All rights reserved. Intel, the Intel logo, Intel Education Initiative, and Intel Teach Program are trademarks. For Students. What is Copyright? “The exclusive right to produce or reproduce (copy), to perform in public, or to publish an original literary or artistic. Slide # 1. 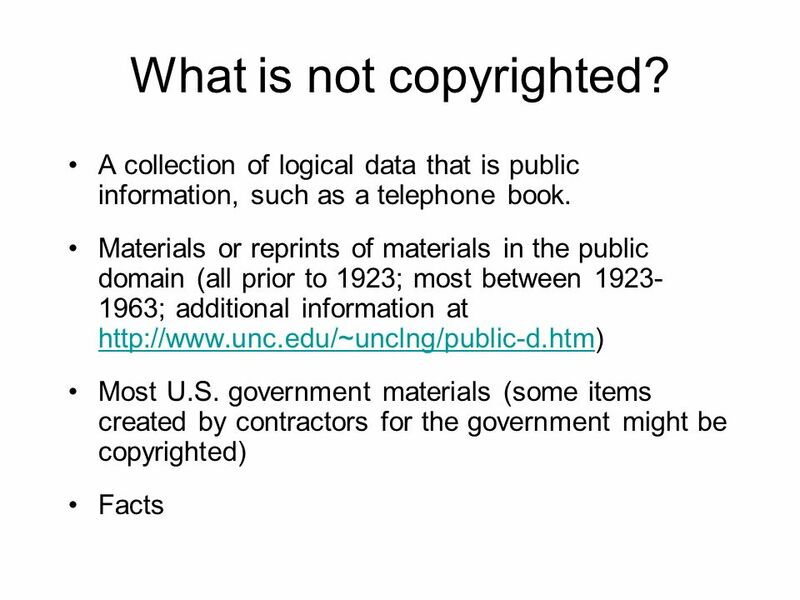 Slide # 2 What is Copyright? Laws have been created to protect authors and artists that create things that are creative and “original.” If.